1Position rack in the middle of the oven and preheat to 325°F. 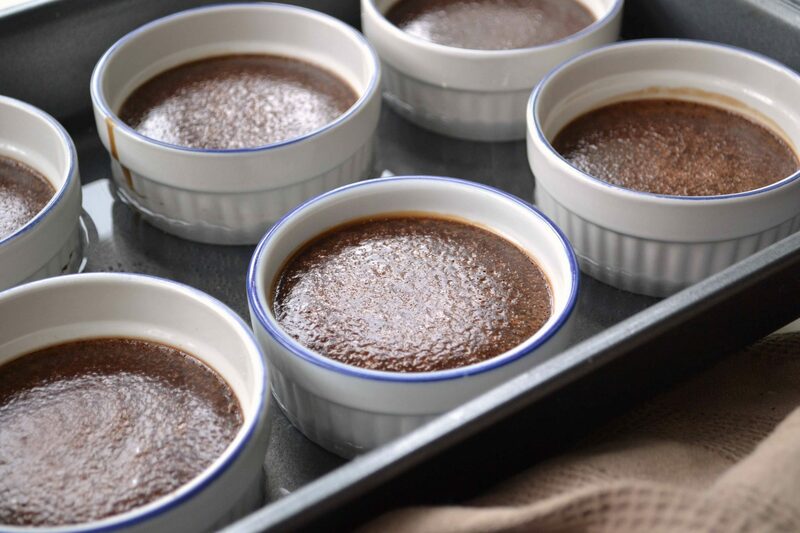 Arrange six 3/4-cup ramekins in a roasting or 9x13-inch pan. 2In a medium saucepan, heat the cream over medium heat until it's steaming; remove from the heat and add the chocolate and espresso powder. Let sit for a few minutes, then whisk until smooth. 3Meanwhile, whisk together the egg yolks and sugar. When the chocolate mixture has cooled a bit, whisk it in. Divide the custard between the cups, and pour warm water into the pan to come halfway up the sides of the cups. Bake for 25-30 minutes, until the custards are set but still just slightly jiggly in the middle. Cool, then refrigerate until well chilled - at least 2 hours, or up to a day or two. 4Serves 6 very happy people. 5Espresso Whipped Cream: whip 1 cup chilled heavy (whipping) cream with sugar to taste and about a 1/2 tsp. instant espresso or coffee - again, you can add more or less according to your preference. Taste as you go.